Apollo Bay Eco YHA i Apollo Bay, Australien : Boka nu! Apollo Bay Eco YHA is a stylish and comfortable ECO Certified Nature Tourism accredited hostel located in Apollo Bay along the famous Great Ocean Road. Situated between the rainforests of the Otway Ranges and the Apollo Bay surf beach Apollo Bay Eco YHA is the perfect base for exploring this amazing region. Hostel facilities include free on-site parking, a wood heater, two spacious communal lounges, two communal kitchens, shared bathrooms, a TV and reading room, free Wifi Hot Spot (Wifi Plus also available), DVD hire, several outdoor balconies and a rooftop deck complete with a BBQ offering spectacular views. Passive solar design, clever zoning and water consumption techniques are used to reduce the level of energy consumption and give you a great getaway with the knowledge your bed doesn’t cost the earth! Various room types are available including 4 multi-share, twin/double and family rooms. Each room is heated and comes with lockers and an individual bed light. Please note that all bathroom facilities are shared for all room types. Apollo Bay Eco YHA is close to all the action with only a 2-minute walk from restaurants, cafes and beach in Apollo Bay town centre and a 90-minute drive to the Twelve Apostles. 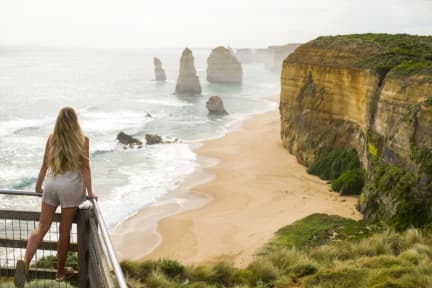 The region is nature lover's haven with deserted beaches, Cape Otway Lighthouse (Australia’s oldest lighthouse), the Great Otway National Park complete with rainforest and waterfalls and of course the Great Ocean Road drive! Head further into the Otways to try your luck spotting glow worms at Melba Gully, the elusive platypus at Lake Elizabeth or the wild koalas at nearby Kennet River. Feeling adventurous? Activities in the area include surfing, windsurfing, snorkelling, horse riding along the beach, hiking, paragliding, kayaking out to the seals and the Great Ocean Road walk. A really nice hostel to stay at while exploring the great ocean road. A nice location and clean hostel. A good stay on The Great Ocean Road trip. Eco and nice looking hostel with a lot of social space. Nice kitchen!